I always feel that good skincare regime is exactly one of the things we can do to keep our skin well taken care of. To me, it starts with good cleansing and sufficient moisturising steps. The thing about skincare is tricky, because it's something we apply onto our face all the time. We don't want to apply products with harmful ingredients, don't we? Which is why I've been a huge fan of FANCL. 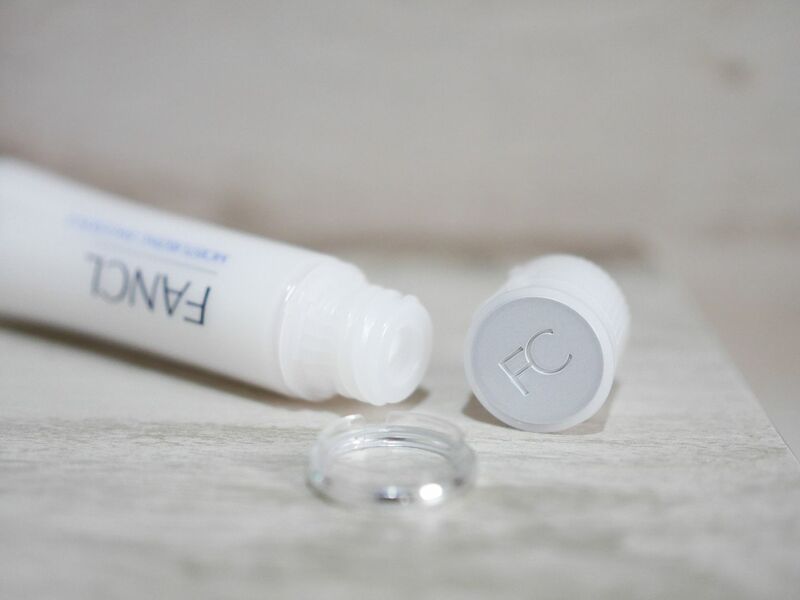 FANCL is well known to be a leading No Preservative beauty brand, and I'll tell you why it's so important that they do not add in preservatives in their products, and how harmful preservatives and other harmful additives are to our delicate skins. 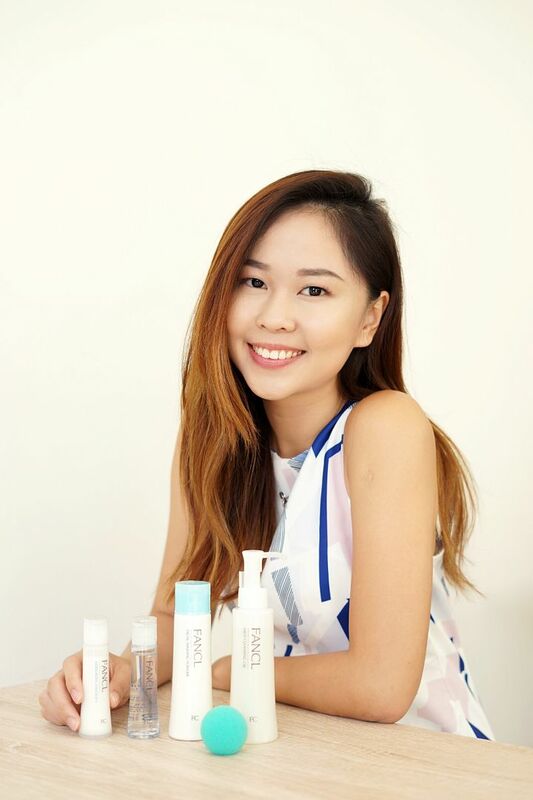 Follow me and discover the secrets of No Preservative beauty brand, and why I love FANCL so much! If you haven't read about my trip to Hong Kong to understand FANCL's products and origins, you can read more here. Here's a video showing you the regime! Preservatives in our skincare products might not sound harmful in the short run, but in the long run, preservatives can hasten process, cause skin sensitivity overtime and eventually alter our skin's DNA. Our skin has already suffered too much externalities during the day, the least we want is to add on more harmful additives and preservatives onto our skin, isn't it? Indeed, I noticed that FANCL products are mostly very small bottles. Not only do I like the fact that small bottle sizes are easily transportable, it also means that the products won't be left opened and exposed in the air for too long. This way, it only delivers the freshest and most effective benefits to the skin. Gone are the days I fear about expiring products because I know I can finish the products within 1-2 months (which is also the ideal case). It's quite uncommon to see products imprinting their production dates on the product. Even if they do, they would not have it with the expiring dates, because that will fix the shelf life of the product. Finally, I see that FANCL is all about keeping the products clean and uncontaminated. All products are hermetically sealed, as you can see from the silver ring around the cap. 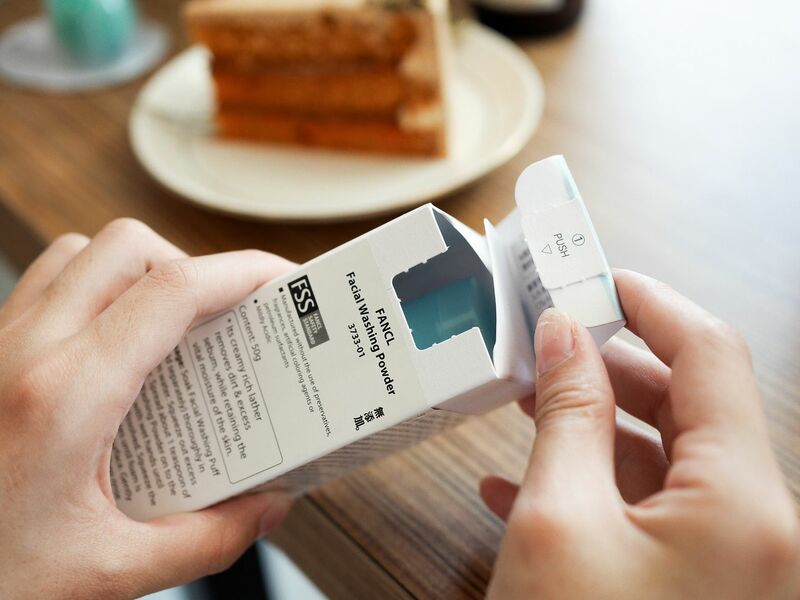 This way, you only open the products when you want to use them, ensuring maximum freshness. I can't emphasise how important it is to do thorough cleansing! Effective cleansing removes impurities and dirt off our skin and pores in order to allow products to fully absorb. 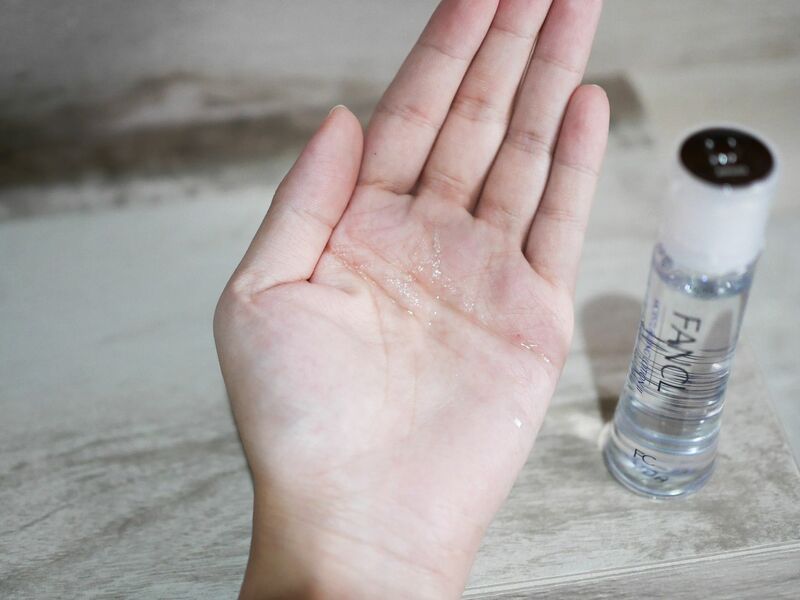 The great thing about FANCL Mild Cleansing Oil is that it contains no mineral oil but Keratotic Plug Removal Oil instead, which dissolves dirt in pores, unclogs pores and prevents oiliness, blackheads and acne in the long run. When I first try this Cleansing Oil, I fell in love with how gentle yet effective it is in removing my makeup. The cleansing oil also acts as a cushioning layer between skin and fingertips, hence reducing friction and pulling or rubbing of skin during cleansing. Likewise, the Nano Cleansing Particles also allows easy penetration to pores to remove makeup thoroughly. The amazing thing about this Facial Washing Powder is that it foams up very well with the help of a sponge ball. The thick airy facial foam feels so fluffy on my palm and skin, it's very comfortable to wash my skin with. Besides, if you lather well, the foam is so dense it doesn't fall off. Many people have the impression that washing powder turned foam will dry the skin. 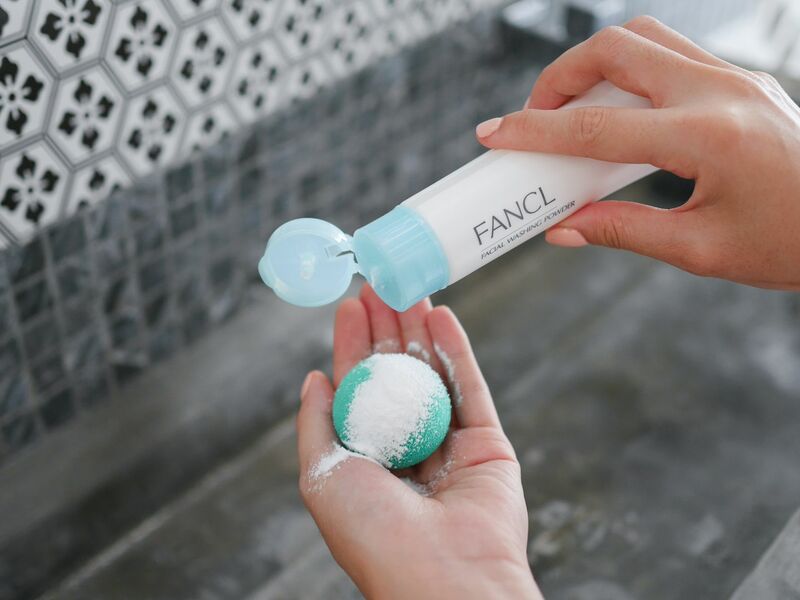 The good thing about FANCL Facial Washing Powder is that it contains amino acids cleansing ingredients, an excellent cleansing agent while retaining skin’s moisture. I have very sensitive and dry skin but this definitely doesn't dry my skip at all. Direction: Gently knead the powder with the washing ball multiple times until a thick cleansing foam starts to form. Massage the foam onto your skin in circular motions. 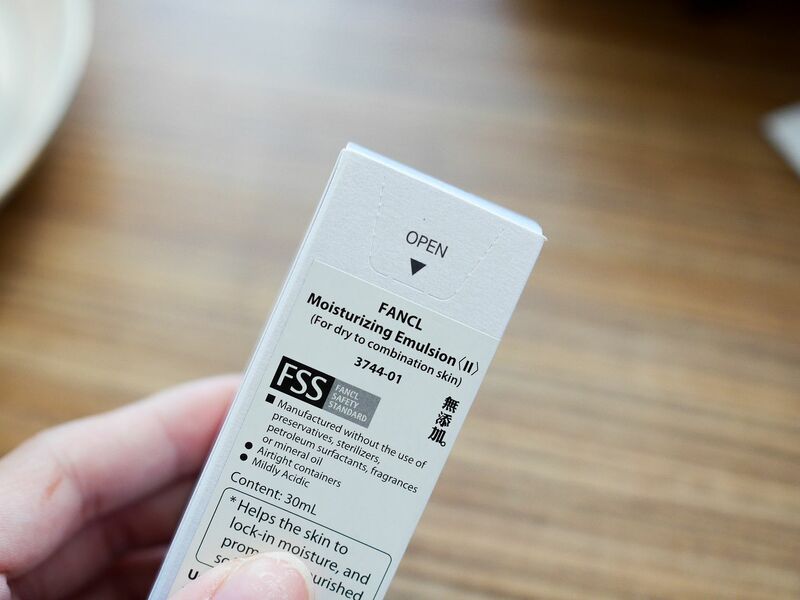 To start off the moisturising steps, use the FANCL Moisturising Lotion II to moisturise your skin. Its soft and light texture feels exactly like water, with no stickiness or residue. This moisturising lotion contains active ingredients like Raffinose, Royal Jelly Extract and Rice Ferment Filtrate to keep skin moisturized all the time. If you're wondering, FANCL Moisturising Lotion II works just like a Pre-Essence/Essence Lotion. No cotton pad required, but dispense a few drops on your palm and pat onto your skin. The last we want is to tug and pull our skin with the cotton pads. "What about toner? ", you might be wondering. Toner is often used to double cleanse the skin, but this has already been resolved with FANCL Mild Cleansing Oil, so my skincare regime has been cut down to lesser steps for higher efficiency. I've actually finished a bottle of both FANCL moisturising lotion and emulsion and I love it so much because they're so light and effective in moisturising. My skin is very sensitive so I am guessing the no preservatives aspect plays a huge part. Direction: Apply roughly 5-8 drops of moisturising lotion onto your skin. Can do tapping motion to help absorption. Once you completed using FANCL Moisturising Lotion II, it's time to lock in the hard work previously! FANCL Moisturising Emulsion II forms a moisture lock layer on the skin surface to balance moisture level of your skin, leaving it smooth and moisturised over time. Not surprised to know why my skin has been loving this, when the key ingredients are Raffinose, Royal Jelly Extract and Rice Ferment Filtrate, all of which are skin moisturising 'agents'. 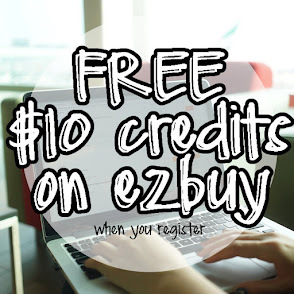 Plus, don't forget there's no preservatives or skin damaging additives in their products! The texture of the emulsion is of course thicker than the lotion. It's however not too thick or rich for my sensitive skin, although it's a bit hard to dispense it out of the bottle. Nonetheless, I enjoy using this emulsion and I would say this two together suffices for my moisturising regime. Direction: Similarly, apply roughly 4-6 drops of moisturising emulsion onto your skin. Can do tapping motion to help absorption. You can actually download the app iFANCL, from iTunes and Google Play on your mobile to enjoy vouchers and exclusive promotion notifications.